I am on an Eggs Benedict kick. I love eggs! I think Eggs Benedict is my favorite. Like the Frittata kick I was on last year and subjected my friends and family as food testers (not that they suffered any); I am now on the best Eggs Benedict recipe search. Inspired by the Potato Patch Restaurant in Deland, Florida, when I visited last summer, I ordered their Eggs Benedict dish and was in Heaven. They used smokey sweet ham for their meat, and their Hollandaise sauce was divine. I have been dreaming up different ways to make my favorite breakfast dish. I used what I had in the house but did not realize I was out of English muffins. Portobello Bella mushrooms I had in the refrigerator and thought why not try the mushrooms instead of English muffins. Not quite the vegetarian dish because of the Canadian bacon but the dish can be if you wanted. Enjoy! In a pan with high sides, fill up with water till about 1-1/2 inches from the top. Bring to a hard boil and then reduce the heat until the water is just simmering. Heat up a grill pan on medium high heat, brush with olive oil and then brush the top and inside of each mushroom with the oil. Put mushroom face down on grill and season with salt and pepper. Cook for approximately 5 to 10 minutes the mushroom will wilt slightly and have water in the cups, flip the mushrooms over and cook the bottom of the mushroom for about a minute or two get rid of the water (mushroom juice). Place the Canadian bacon on the grill and cook for approximately 3 minutes. Remove from the grill. Turn the mushrooms back over on the grill and lay the Canadian bacon inside the cup of the mushroom. Put about 4 to 5 baby spinach leaves on top of the bacon and let the mushroom, Canadian bacon and baby spinach cook for about a minute or two. Take the mushrooms off the heat and put aside. In a pan with simmering water, add one teaspoon of vinegar. The vinegar will help keep each egg together (congeal) and not spread in the water. Cook the eggs in simmering water for approximately 4 to 5 minutes and remove with a slotted spoon onto a paper towel to collect any excess water from the egg. Remember, you can cook the eggs longer to your preference but you will want to have some yolk to flavor the dish. Slice the tomato. Cut the avocado in half and remove the pit. Remove the avocado meat from the skin and slice. 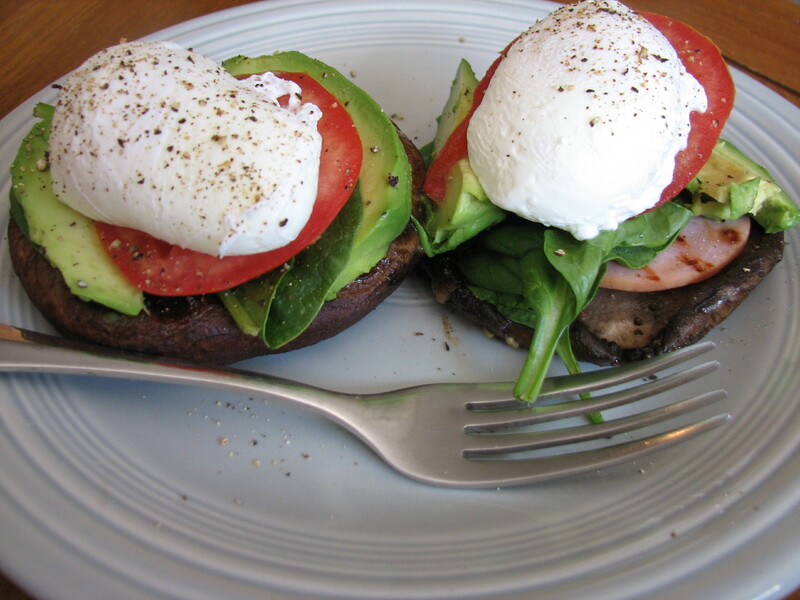 Place the (2) grilled Portobello mushroom tops on the plate, add 2 slices of avocado per top, and one slice of tomato and then put the poached egg on top. Season the eggs with salt and cracked pepper. Eat and Savour! Cook Tip: You can add hollandaise sauce on the Eggs Benedict but I wanted to keep the fat content down, so I chose not to add the sauce. FYI – 1 Tablespoon of Hollandaise sauce is 67 calories and 7 grams of fat. My friend is a mushroom freak. She loves mushrooms prepared any way I think, so this one is for you. She always looks like a happy camper when she eats mushrooms. I found this recipe in a magazine, I just cannot remember where but as usual, modified it to what I had on hand. The recipe calls for red pepper but I am allergic to peppers so I omitted them. However, you can add if you wish but I cannot vouch for the flavor with the red pepper. I thought it was amazing without it. An excellent appetizer or a side dish with a salad, or you can just eat 2 or 3 a main meal. Guaranteed to fill you up! Preheat oven to 450 degrees. Cook the orzo according the package directions, and set aside. Remove stems from Portobello mushrooms; scrape the black gills from the underside of the mushroom using a spoon and place on a cooking tray or stone. Brush or drizzle mushrooms with olive oil, season with salt and pepper and bake for 5 minutes in oven. 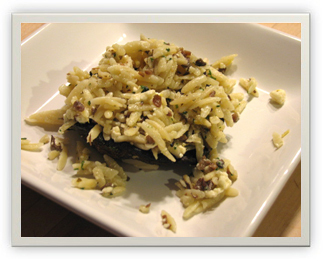 (The first time I made the mushrooms I thought the 8 to 10 minutes the recipe called for was too much – the mushroom was almost too soggy or overcooked). Dice up the mushroom stems. Heat up 1 tablespoon of olive oil in a sauté pan over medium high heat and sauté the mushroom stems and red pepper for about 5 minutes until soft. Put in a bowl, gorgonzola cheese, lemon juice and zest, seasonings and orzo. Mix well. Spoon the orzo filling onto baked Portobello mushroom caps, letting some spill over onto the plate. Serve warm. Cooking Tip: Mushrooms are like sponges. You should never wash them in water as they will absorb the water and the mushroom will taste tough and water logged. You can use either a damp paper towel or a towel and gently wipe down the mushrooms, removing any dirt and set aside. Stems are excellent for flavoring dishes. Don’t throw them away, dice them up and sauté with other vegetables in the dish to add more flavor.